The hurricane hunters were out today flying inside of our tropical low trying to see if a tropical cyclone had formed or not. Usually what they are looking for is a closed circulation and a warm core. Today, they were doing surveillance from the inside to get a status report. We already knew that this system has a closed (although somewhat mobile) center. We already knew that this did not have enough convective activity to be deemed a tropical cyclone. They were likely looking for a temperature and wind profile so that the models could get a better look and thus a better forecast for all of us. They are progged to go back out tomorrow, but their mission tomorrow may be slightly different. We’ll get to that in a bit. It should take roughly one more day (+/- 1 day) until the formation of a tropical cyclone – depression or storm named Arthur. 70-80% of the models running this evening brought this tropical low up to tropical storm strength within 24-30 hours. The data from this afternoon’s flight has not been added to most of the models yet, so that could change. We could almost expect diurnal conditions should provide a boost to convection, which may allow enough of an uptick in thunderstorm activity to allow it to be classified as a tropical depression or storm. Dry air remains largely above 400 mb (upper levels) according to the models, that is largely the biggest battle this system has to defeat. 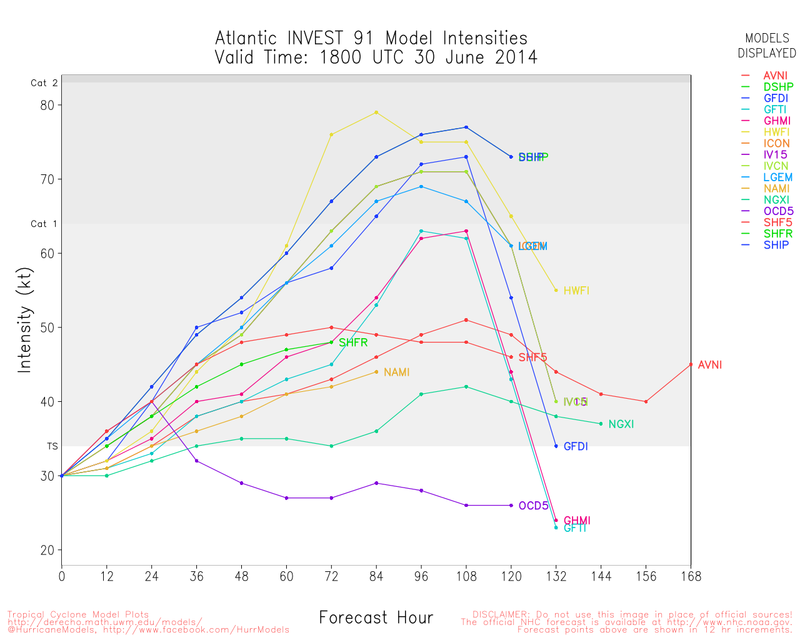 According to the HWRF, this could be a problem all the way past the recurve and closer to the Carolinas. GFDL also shows the dry air in the northwestern quadrant. Shear also upticked a bit this afternoon, however this should weaken just a bit tomorrow. Conditions overall are expected to improve a small bit. Warm waters should prevail over these challenges, however they should limit any intense intensification. A moderate tropical storm is still in the cards with possible further strengthening. Something to notice in the below intensity models is that a number of good models now make 91L a hurricane in a few days. There is a possibility that a hurricane could be approaching North Carolina on July 4th. The next 24 hours will be critical for not only intensity, but also track. Early on in the life cycle of a tropical cyclone, the center is often erratic, undefined, and/or numerous in count. That is the stage where we are now. High pressure continues to push this weak system to the southwest. Tomorrow this will turn west and eventually north as this system strengthens. How, where, and when that turn takes place will be critical for the rest of this storm’s life. 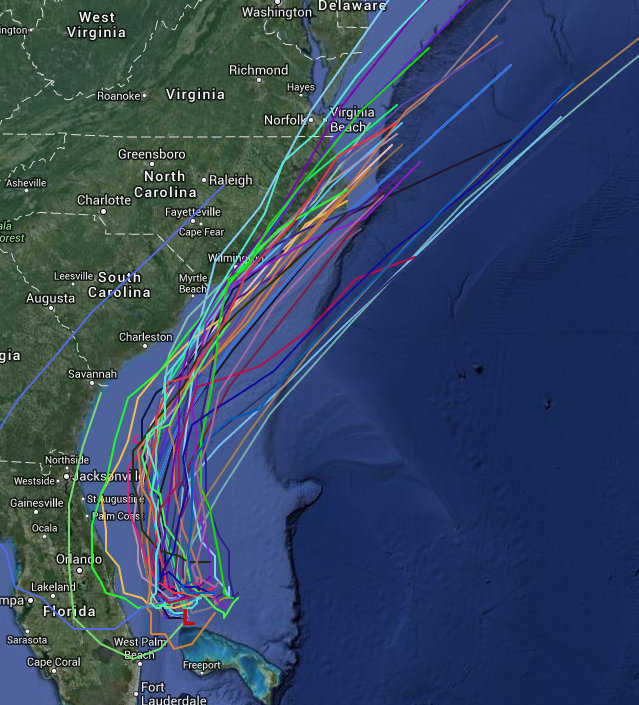 If it goes further south or west than the models currently show, then the entire track will have to shift west. Contrary, if this system turns sooner or farther east, the track will shift east. Fortunately for us, the models are pretty consistent with the turn and a North Carolina scrape toward the end of the week. We should see signs of a turn overnight in the satellite patterns. We should begin to see an elongation in the satellite appearance toward the direction in which the system will go. Tomorrow: Gusty winds and heavy rain will be possible in the northern Bahamas and on the Florida east coast. Tropical storm watches/warnings may be needed for parts of the states upon formation. Rain will likely rotate across southern Georgia and much of Florida tomorrow with up to an inch of rainfall. Start planning indoor or delayed celebrations for July 4th. Please keep fireworks outside!! When the first tropical storm of the season forms, it will become Arthur. Tomorrow’s hurricane hunter flight should be a mission with two purposes: one to prove existence of a closed center and to detail the winds inside of 91L. Posted on Monday, June 30th, 2014, in Florida Weather, Tropical Weather. Bookmark the permalink. Leave a comment.